If you would like to track your 'application source' when using the application URL method via idibu (Apply's URL's), we can provide the means to do this. This is a hidden option in idibu, however if you do want to use Apply URL's and track your sources, please let us know via support so we can enable it for you. 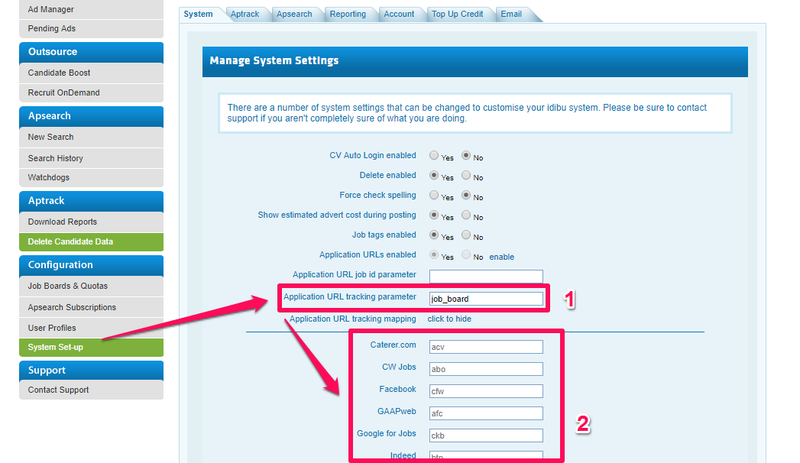 Here, you will need to provide your 'custom tracking parameter', as per the screengrab above (1). ..then you should provide a custom tracking parameter that your ATS will understand, and will be able to record application sources based on the custom parameter and it's value. Let's use 'job_board' as an example parameter here. Default values can be seen here (you need to be logged to your idibu account), however you can also map custom values to any board you are using instead if preferred.. To do that, just use 'click to edit' next to Application URL tracking mapping on the Settings page, this will open up the board list (as you can see above - 2). Then, just provide a custom value for any of your boards and save the page. Ultimately you will end up with custom apply URL's for every posting, which will therefore allow your ATS to track exactly which job board the candidate was redirected to you from. You can also use this mechanism regardless whether you are posting via idibu directly, or using our API to post to any board supporting this Apply URL functionality. If posting via our API, then just remember to use the dynamic core field 'app_url'. With all this in place, idibu can provide you with detailed analytics, even though you'd be using your landing page for application process. Why spend a lot of time developing your own, independent reporting if you can use idibu's out of the box solution?